When I last looked at shooting percentage I found two things. The first was that there isn’t a large difference in sh% between a good and bad team; a top 4 team will have an average sh% of ~24%, whilst the worst teams average ~20%. The second was that there is a large variation around the mean, with a standard deviation of 4%. I’m now going to extend on that post and quantify how much sh% regresses to the mean over consecutive seasons. From this we can determine how much of the variation from the mean is luck and how much is skill. 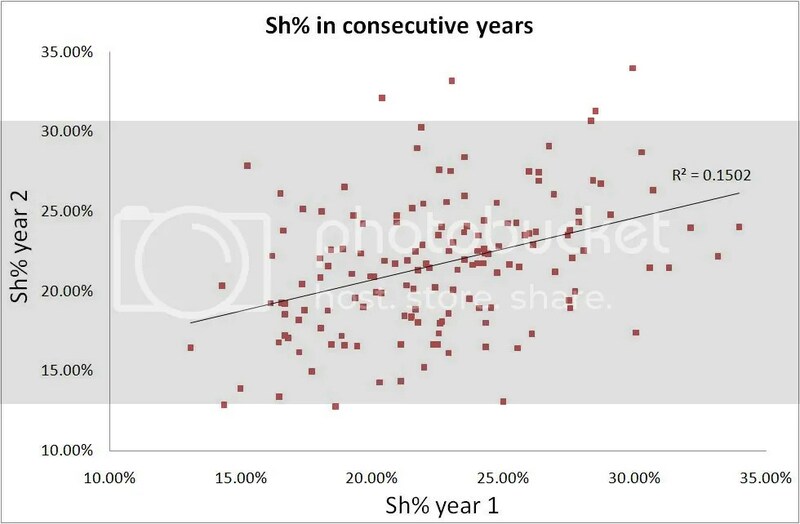 The plot below is of sh% in ‘year 1’ against sh% in ‘year 2’. The R2 value is tiny, 0.150, meaning that sh% shows 61% regression to the mean from one season to the next. The conclusion is that luck plays a massive role in team shooting percentage and how well a team does one season has minimal bearing on how they should be expected to perform the next season.